Sony is looking to buck this trend, though, with the Sony VPL-VZ1000ES. Revealed at CES 2017, this projector is as short throw as they get. 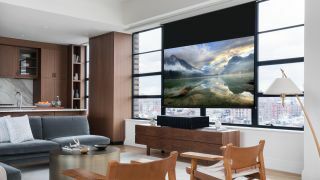 You can have the thing just six inches from a wall or screen and it will project a 100-inch 4K, HDR compatible picture, which means you don't need a dedicated media room - just a fancy big living room. The device measures just 925 x 494 x 219mm, weighs in at 35kg and is a sleek black box, so should slip into most living room decor. It's 40% smaller than Sony's current short-throw projector, the VPL-GTZ1 but despite its size still outputs 2,500 lumens which is 25% brighter than its bedfellow. This is all thanks to Sony's advanced SXRD panels and its Z-Phosphor laser light engine. These combine to make the HDR content sparkle and have the added bonus of hitting peak brightness much quicker than your standard projector lamps. If this all sounds too good to be true, then you will be relieved to read that there is something of a catch, and that's the price. This is cutting-edge technology, which means that you will have to pay something of a premium for it. We aren't talking the price of a stupidly expensive media room but it is going to retail at a cool $24,999. If your jaw hasn't dropped to the floor, then you can buy the VPL-VZ1000ES from April.